A short distance outside of the touristy area of Stowe you will find the Green Goddess. It’s a small place in a mini complex and you are likely to miss the sign, so drive slowly. Once you find it, however, you will be amazed by the great food with vegan options at low prices. Once inside you will notice that they have a different way of doing things. There is a piano on the back wall, colouring paper and crayons for kids, a changing table and full wheelchair access in the washroom and an emphasis on using local produce, healthy food and quality ingredients. There is an overall peaceful air about the place. 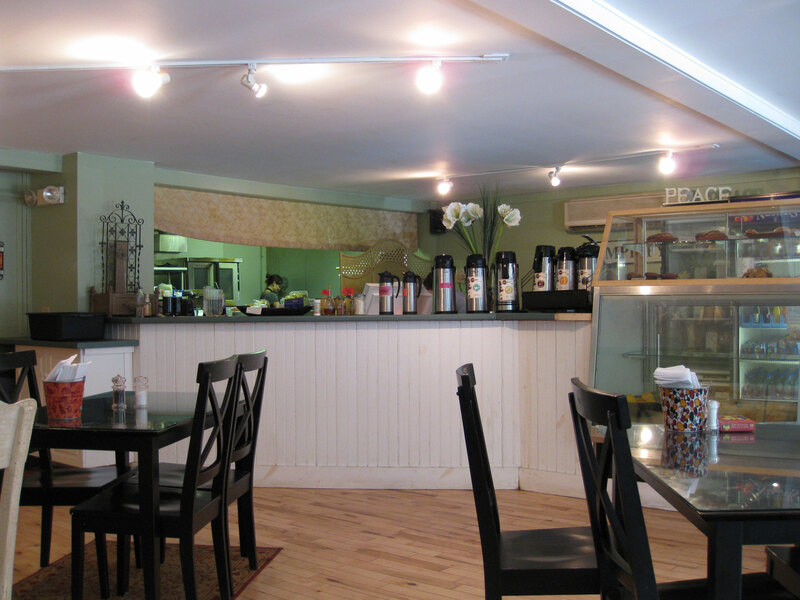 The Green Goddess is a vegetarian and vegan eatery, although not every item on the menu is vegan since they do use eggs and dairy. They have a variety of local coffees to choose from. There are no free refills although the cup is very large and a refill is only $0.75. 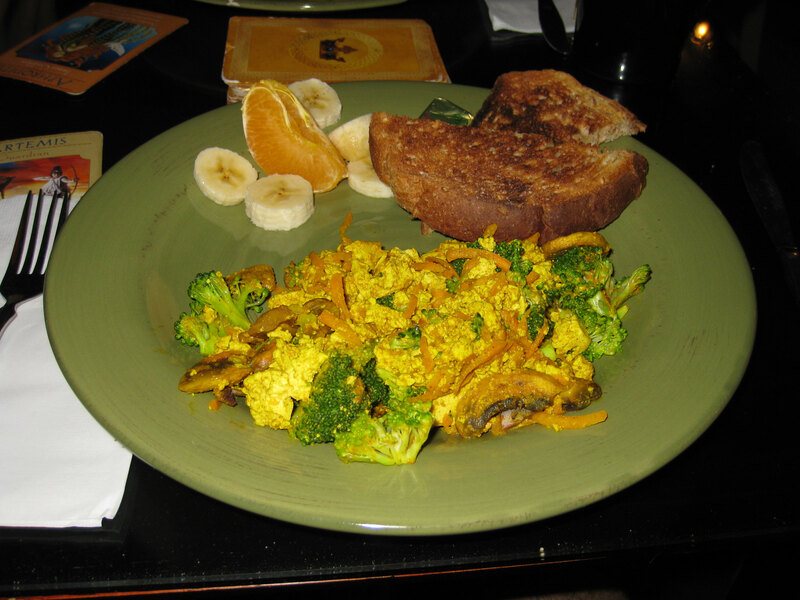 We had the tofu scramble ($5.50) and it was good as well as filling; it came mixed with broccoli which I originally thought was an odd pairing but it actually works well. The plate came with a side of toast, a banana and other fruit; the fruit was very fresh and the plate was well priced. 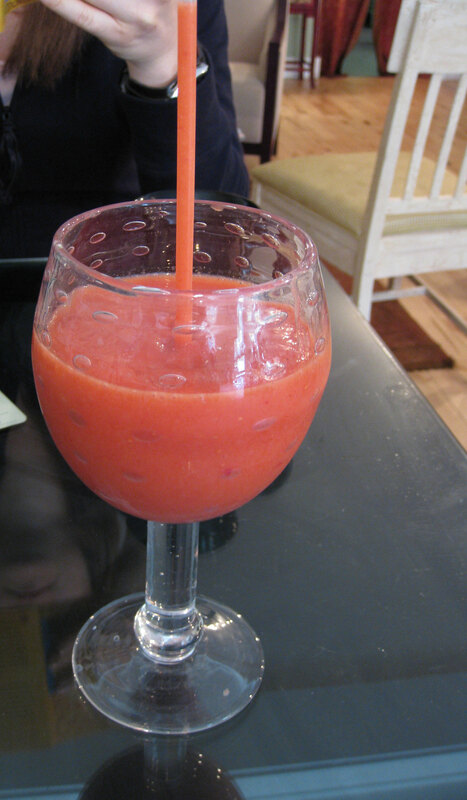 There was also an amazing smoothie ($3.00) of raspberry, papaya and banana. It’s not on the menu but you can combine the fruit options at no extra price. Not only did this pass the straw test (where the drink must be thick enough so the straw can stand on its own) but it went beyond all expectations, it was one of the thickest smoothies I have ever had. Service was very good; they did a great job at explaining the dishes and ingredients as well as the various coffee blends used, and even though there was no need to come around for refills they still came to check on us often enough. Although not all dishes on the menu are 100% vegan they are definitely vegetarian at the least. Now I should note that for serious vegans there is no segregated cooking area but the grill is cleaned before any vegan dish is put on. The main vegan dish to try is the tofu scramble and although there isn’t a lot of choice on the menu for 100% vegan dishes you will be quite satisfied and full. 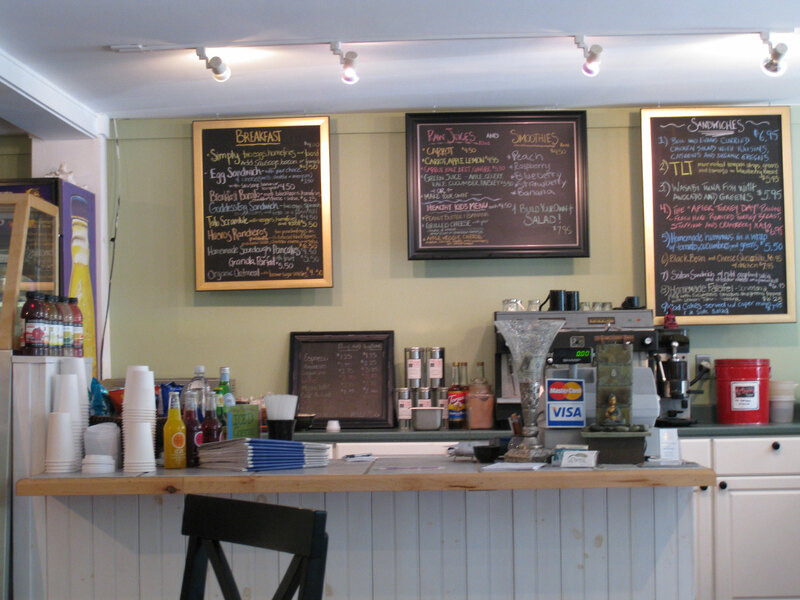 If you are in the Stowe area and are in need of some breakfast or brunch do try out the Green Goddess, you will not be disappointed. The food is good, well priced and it is family friendly as well as veg/vegan friendly. Am so glad I found your site! I too am obsessed with breakfast. 😉 Just wanted to let you know that you’ve accidentally linked to the (ancient) Byblos site here instead of Great Goddess’s. Thank for letting me know (my bad on the link error). Unfortunately I could not find an official site, although if you are in Stowe do check out green goddess cafe, I’m sure you will like it.